17:08 Things seem to be quietening down – protesters are filtering away and disturbances have been kept to a minimum. It has been an overall peaceful protest, with only a few breaking away from the crowd’s designated route. 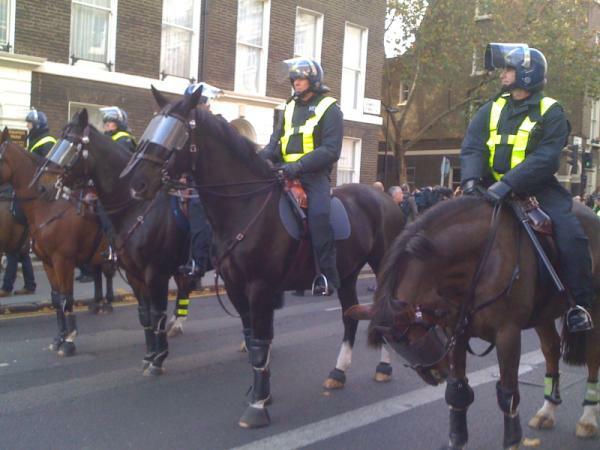 17:00 It seems that the heavy police presence around London has certainly kept disturbances to a minimum. Of the 20 arrests so far, the charges range from violent disorder and affray to breaching the peace, with one arrest for possession of a weapon. 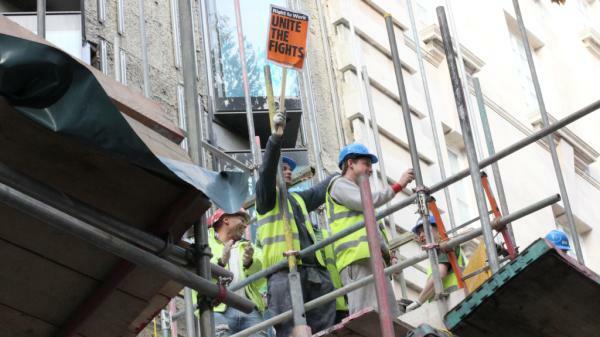 16:45 Earlier today builders showed unanimity with the protesters on top of scaffolding. 16:39 Reports that the atmosphere at London Wall seems to have developed into a rave – lots of loud music and protesters dancing and drinking. 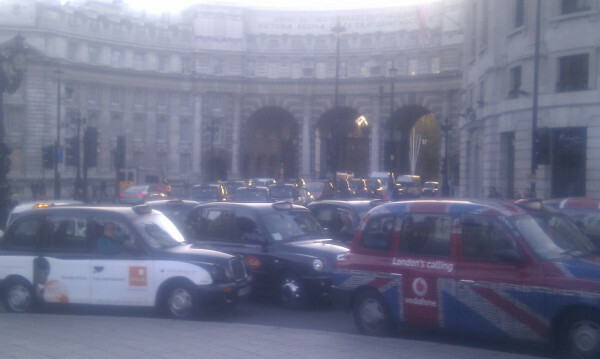 16:25 Reports of around 20 arrests so far – there is currently a taxi protest around Trafalgar Square. 16:16 There have been arrests at London Wall. Reports say that several protesters have been drinking. The energy of the marchers appears to have picked up and crowds are now much larger than they were earlier. 15:43 All aproaches to Trafalgar Square open again. The break-away group is said to be around 100 people but there is no clear route for them as yet. 15:25 March has reached London Wall – reports of several shops boarded up. This is the final destination of the march and there is now expected to be an hour-long rally. 15:13 reports of some kind of explosion in the crowd, believed to be a firecracker or something similar. 15:09 Met Police report that the head of the march has entered Holborn Viaduct. A number of arrests have been made so far. 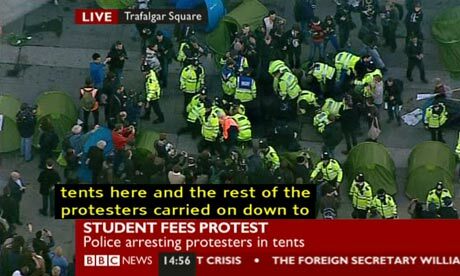 15:03 Police are removing protesters camped in Trafalgar Square. 14:39 The march has been split with the front part standing on Fetter Street but the majority being held back. 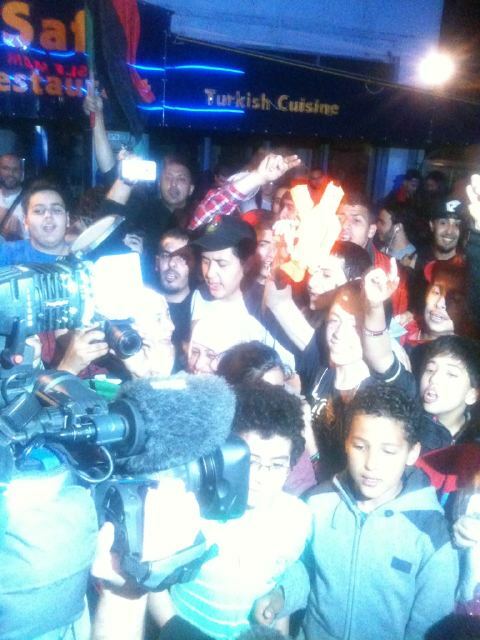 @billykenber has tweeted “Small groups of masked youths in the crowd which is lingering at junction with Fetters Lane”. 14:22 According to @BBCTravelReport, Shaftesbury Avenue and Charing Cross Road have reopened. 14:15 Met Police report that a small group of protesters have broken away from the main group and have broken Section 12 of the Public Order Act. The main front of the student march has now reached Aldwych. 14:06Gower Street has reopened to southbound traffic. 13:57 Wilkinson_David, a CNN journalist, has tweeted: “Police bringing dogs to the front line of the student march on the Strand”. 13:44 @suziruk tweeted: “Big group have broken away from the march and are pitching tents to occupy Trafalgar Sq” – several other reports of a large group who appear to be straying from the designated route. Just checking this now. 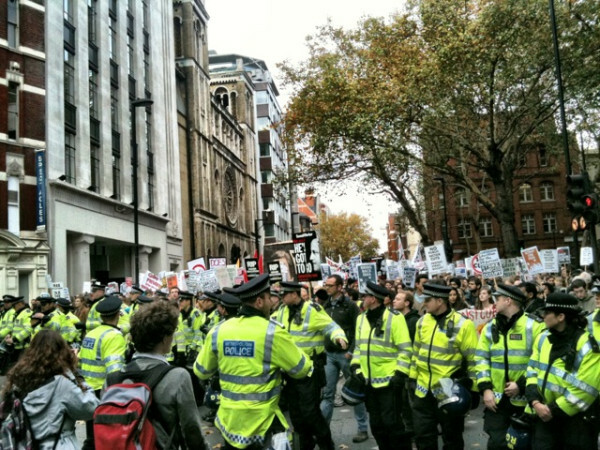 13:36 Reports that protest has been good natured so far – protesters heading towards Trafalgar Square. Large police presence there. 13:27 Protesters have been given a 2 hour limit to disperse at the end of today or they will face arrest. 13:22Police in Trafalgar Square arranging themselves to prevent pedestrians getting caught up in the protests. 13:14 So far everything has been very quiet – nowhere near the expected numbers for the student march as yet. Currently checking reports of protesters in Trafalgar Square. 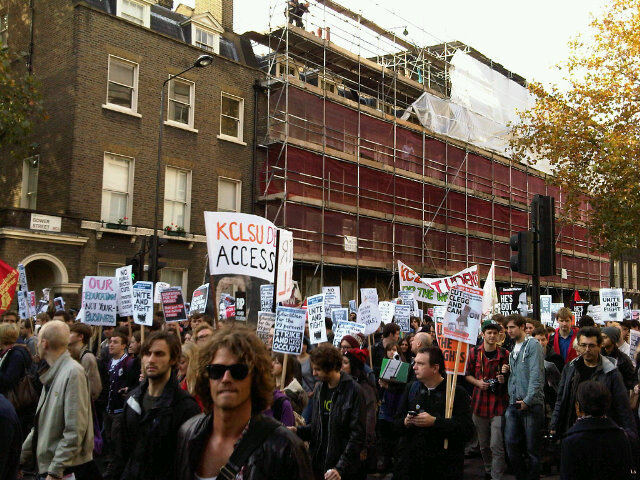 13:04 Student protesters moving through Gower Street – around 2000 strong at the moment. The electricians march is filtering across Southwark Bridge. 12:59 A bit of background on the neighbouring march: Electricians, plumbers and engineers from across the country have formed a protest at the site of construction work at Blackfriars Underground station, and are planning to later lobby MPs in parliament. 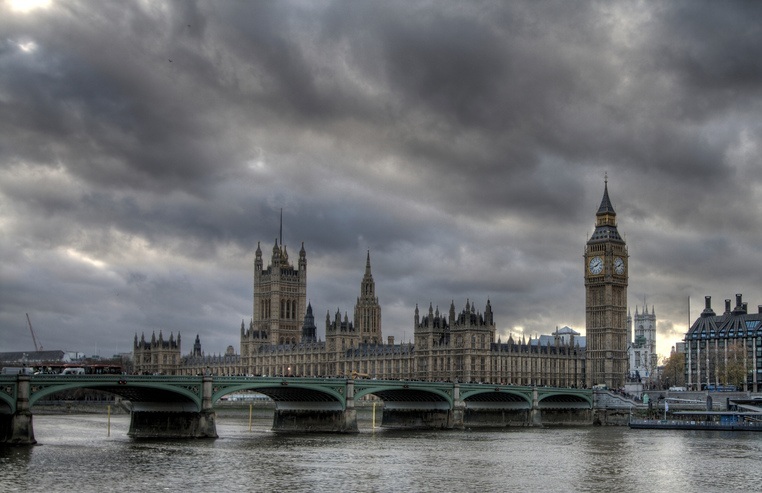 They are demonstrating against pay-cuts which unions claim are being imposed by several construction firms. 12:53@billykenber has Tweeted: “Familiar chants as march sets off: “you say cut back, we say fight back” and lots directed at Nick Clegg” along with a photo of the protesters on Gower Street. 12:49 Protesters have been warned that if they deviate from the planned route, or if they hang around for too long after the rally at the end then they will face arrest. 12:44 rumours of water cannons being used today are false – the @metpoliceuk has just Tweeted saying: “There is no intention of water cannons being used today”. 12:26 So far proceedings are quiet – nowhere near the 10,000 expected protesters. 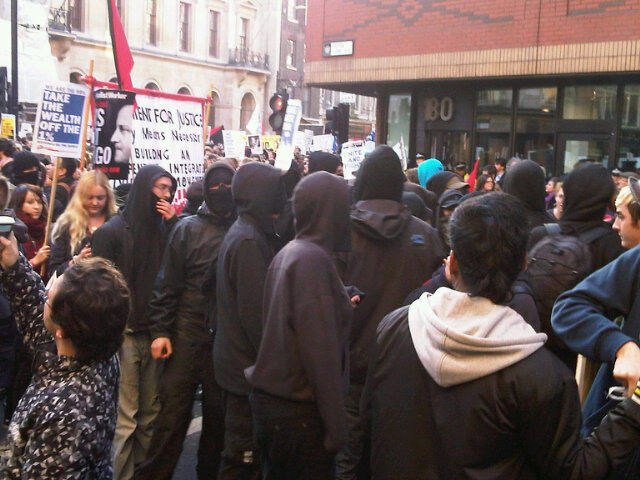 12:07 The Met have said there are 350+ protesters at Malet Street currently with additional people due to join them. 12:03 Police are expecting an hour long rally at London Wall from around 3.30pm-4.30pm. 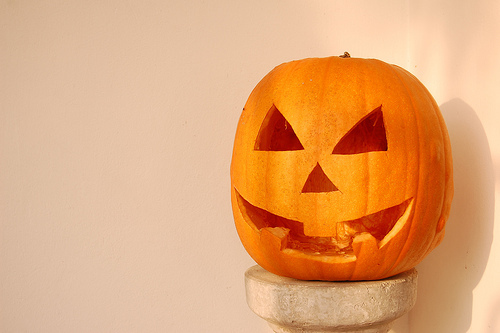 “Participants are expected to disperse by 17:30”. All roads on the route will be closed, with surrounding roads closed when necessary, including London, Southwark, Blackfriars, and Waterloo Bridges. 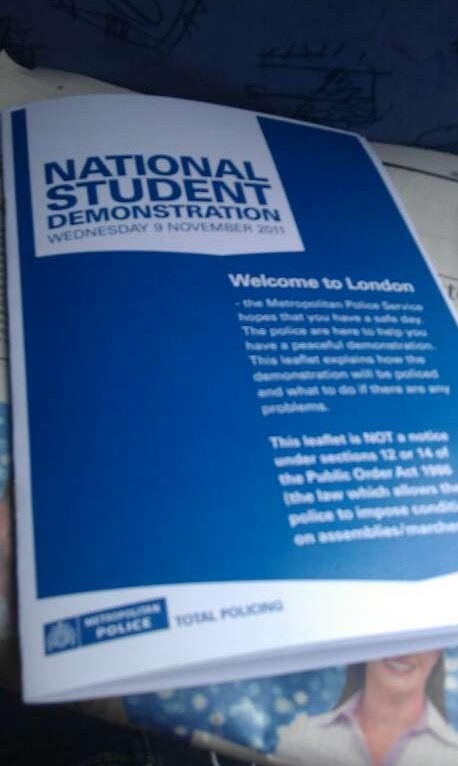 According to the Met Police, “there are currently 300 people at The Shard for the electricians march” which will be happening alongside the student march today. They have also said that police are not expected to use batons today. 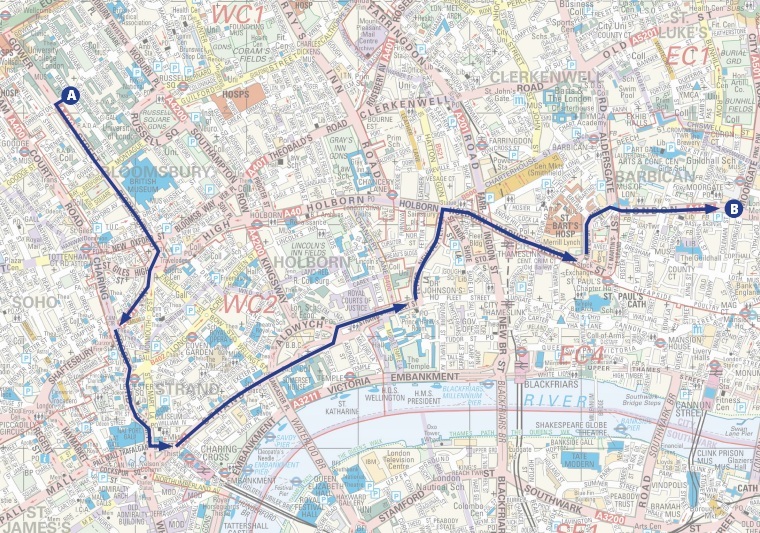 11:53 This is the planned route for the march – Starting at Malet street, the protesters will go along Gower Street, Bloomsbury Street, Shaftesbury Avenue, Charing Cross Road, Duncannon Street, The Strand, Fetter Lane, New Fetter Lane, Holborn Viaduct, Newgate Street, King Edward Street and finally ending up at London Wall. These roads will be closed so expect a lot of traffic diversions! 11:27Large crowds are gathering around Malet Street – some tents are visible. The march is expected to begin in about half an hour. 11:12 An estimated 10,000 students are expected to take part in today’s march against the recent education cuts. The Metropolitan Police have warned protesters that there will be around 4,000 police officers on duty; they have been granted the right to use rubber bullets if there are any disturbances in what is planned to be a peaceful march through London, starting at Malet Street (near Euston Station) and finishing at London Wall. A jilted lover made a hoax bomb threat to get back at her ex-BBC journalist boyfriend after he told her he was having an arranged marriage, a court heard. Ahla Arbid, 33, told airport authorities that Hossain Ansari Pour’s new bride, Sara Aryan Pour, was carrying explosives when she flew to the UK. Prosecutors at Southwark Crown Court said that Arbid, a mother-of-two from Marylebone, West London, reacted furiously when she discovered that Mr Ansari Pour’s parents had found him a bride, who was due to come to the UK. Arbid told the court she feared Mr Ansari Pour was part of a plot to kill hundreds of passengers on an international flight. She reportedly informed airport authorities that ex-BBC journalist Hossain Ansari Pour was plotting to bring explosives to the UK. 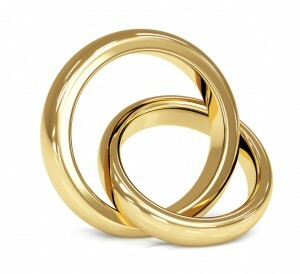 She claimed they were being smuggled from Iran via Turkey by his new bride and sparked a major security alert. Giving evidence to the court, Mr Ansari Pour said his father was a senior lawyer and lecturer in law in Tehran, while he himself had worked for several well-known news organisations including the BBC, and was now head of Farsi at Dow Jones, which publishes the Wall Street Journal. He went on to say that he had already been married twice, once in a ‘full’ Islamic marriage, from which he has an 11-year-old daughter, and also in a previous ‘temporary’ marriage, which, under Iranian law, allows legal sexual relationships on a less formal basis than full marriage. He added: “Even on the first day that I met Ahla, I did tell her my parents were looking for a wife for me”. The court heard that the couple entered into a sexual relationship, and that Arbid later told the journalist she was pregnant by him, subsequently having an abortion. Mr Ansari Pour’s parents found him a bride in Iran, and although he was still engaged in his ‘temporary marriage’ to Arbid, he flew to his homeland for a religious wedding ceremony. He then arranged for his new wife to come to Britain, booking her a flight to London via Turkey on May 2nd this year. When Arbid discovered what was happening, she contacted both the British Airports Authority and the authorities in Turkey to tell them that Miss Aryan Pour was carrying an ‘explosive substance’ to give to her husband in London. Arbid hit back at claims she had alerted authorities maliciously and falsely, insisting that she feared Mr Ansari Pour was a terrorist and was plotting a bomb attack on a plane.